I love the leaves as they are now, so glossy and new. The big vines climbing up my staircase will give me a feeling of living in a wisteria room when they finish blooming and leafing. There’s a a nice new screen on the door this year, so when I open it the house is filled with wisteria perfume and the buzz of fat bumblebees. It’s Memorial Day weekend again. The year turns so quickly! Our villages are filling up, the roads are crowded, and the migration of the Hamptonites is about to begin. I have wisteria and indigo yarn and some good books to read. Sweet Thursday is a favorite Steinbeck of mine. Must remember to re-read. So pretty! There was wisteria all over this neighborhood about a month ago. It made a lovely fragrance. The honeysuckle just ended, too. Lovely, lovely flowers… Here’s to surviving another summer season!! I’ve always wanted lilacs or wisteria, a little leery of the bumblebees though, and never took the steps to plant it. Perhaps this is the year. I’m gleeful that my clematis has taken off and covered my front deck railing, I had purchased a plant that would have blue flowers, but when it finally bloomed, they were white. I can barely remember Sweet Thursday, I read all, and I mean all, of Steinbeck back in my teens, what a thrill when Mrs. Steinbeck came into my store one day and I became friends with her! But I reread Cannery Row a couple of years ago and while I loved his books as a teen, the effect on me as an adult was different and now I feel that I may need to start all over! I think Sweet Thursday was the sequel to it? Plans for the weekend…birthday party for a 6 year old (not mine, the party’s next weekend), t-ball, the parade on Monday, and pretty much staying out of everybody’s way! There will be sand and water and barbecue involved as well I’m sure! Enjoy your weekend! 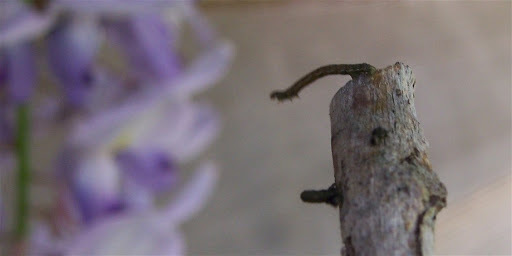 I love wisteria – and hate inch worms – we got home the other day and Rich was picking them off my back for awhile lol Have to head out shopping in a bit – hope I didn’t put it off too long – ugh summer season change of times for doing errands. Wow it’s so bizarre to think the wisteria is just blooming now where you are, not that far north of DC, but many weeks behind us in seasonal time. I love that smell, long gone from the midatlantic, though we’re sniffing roses and honeysuckle (and sipping the sweet nectar of honeysuckle, too! )Rolling Thunder is in town. It’s summer. Happiest summer to you! 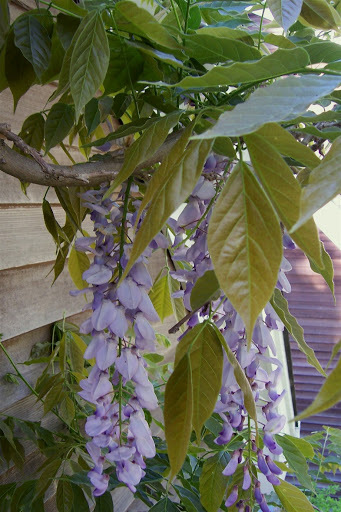 We just bought a wisteria yesterday – I can’t wait to plant it and have it bloom and watch it take over the fench we are planting it next to. Beautiful picture! Have a wonderful holiday weekend. I’m so jealous. We have a yardful of lilac smell, which is wonderful. But you paint a lovely smell picture of the wisteria!It’s Memorial Day weekend here, of course, too, but also Middlebury College commencement. This year’s speaker? Some guy named Bill Clinton. Middlebury town population: 8,500. Commencement speech audience: Limited to 7,000. You do the math.